We live in an era where everything operates on the word “now.” With the internet, smart phones, and other technologies, it’s possible to operate faster than ever. Emails are sent at the click of a button in only moments. How can we keep up? There are fifty things you need to know in order to get things done quickly, in every aspect of your life. Learn from these tips to make your life less stressful. Identify your strengths and use them to your advantage. What things are you best at? Identifying your best qualities and seeking out opportunities that celebrate these qualities will allow you to be efficient in your work. If you are good at math, working at a bank is an easy fit for you. Identify your weaknesses and employ help to conquer tasks that require those skills.While we use our strengths to our advantage, we don’t have to think of our weaknesses as setbacks. Identify what you are not good at and find others who can help you. 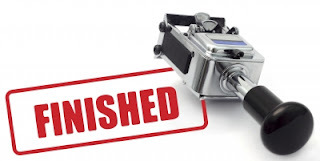 Don’t spend a lot of energy on a subject you are not adept at and let someone else pick up the pieces so you can continue to get things done rapidly. Although it may feel good to suds up in the morning, showering at night will shave at least 15 minutes off the clock. If you have an extensive blow drying or shaving routine, doing those things at night will help you save even more time. Set your alarm for a few minutes earlier. Waking up earlier may not help you be faster, but the added time to your routine will certainly be appreciated when trying to get things done in a hurry. The internet has endless ideas if you’re searching for other ways to do common tasks. Instead of taking the time to plan out recipes for a whole week, search for a meal planning service that will do the leg work for you. Rather than having multiple outfits to choose between, wear a uniform or the same variation on an outfit daily. Dressing in black pants and a solid colored top with close toed shoes and simple earrings is a predictable, failsafe outfit that doesn’t require much thought when dressing for the day. People who schedule time for fitness and maintain their health and wellness are able to work more efficiently. Organized people are more efficient! Write down appointment times to arrive wherever you need to be. You will be on time and ready to go. Eat a well-rounded diet. Cutting out unnecessary sugars and fats from your diet will insure that you are getting the proper nourishment to work fast. Where appropriate, find shortcuts. If there is a speedier way to do something that won’t sacrifice excellence, opt to do it that way. Sometimes you may think the task at hand is too big. Breaking the tasks into small manageable steps may help you get the job done faster. Check off each step to keep you motivated to finish the task. Maybe you don’t have the proper ingredients needed for a recipe in your cabinet, but you could still concoct something wonderful by using a little creativity. Don’t have garlic salt? Mix equal parts garlic powder and salt rather than running out to the grocery store. Clean your home regularly. Rather than waiting a week to clean the whole house at once do a little every day. This way work doesn’t pile up. You’re able to do chores for a couple minutes a day rather than a couple hours once a week. If de cluttering seems overwhelming, try picking up twenty things and putting them in their rightful place. A piece of paper in the drawer, a receipt in the garbage, and a toy put in the bin are already three quick things that take a matter of seconds. In no time at all, you’re on your way to a mess-free zone. 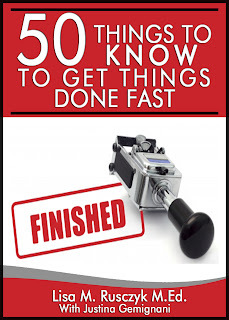 To read all 50 tips view 50 Things to Know To Get Things Done Fast eBook. I ENCOURAGE YOU to borrow the book for free from the Kindle Lending Library for Amazon Prime Members. If you would like to share these tips please email me at lbrennec@gmail.com. Please visit co-author Justina at Justina’s Gems.